Tungsten Carbide rings are quickly becoming one of the most popular choices for wedding bands and casual rings. Customers love the fact that a Tungsten Carbide ring will not scratch and will continue to shine like new for as long as they own the ring. We carry everything from the classic wedding band to the latest trends. 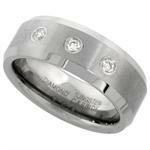 Our Tungsten Carbide rings are always made from the highest quality materials and are always cobalt free.